Since I started my own business and started to design for a living, there is hardly any time left for crafting. No more felting (the wool felted eggs on the photo are the remains of that hobby), no more sewing, painting etc. Since then I have been specialising in quick, easy crafts with a satisfying result. Allthough I miss the process of 'getting there', it is still fun! It really took me only 60 seconds to make this lampshade. 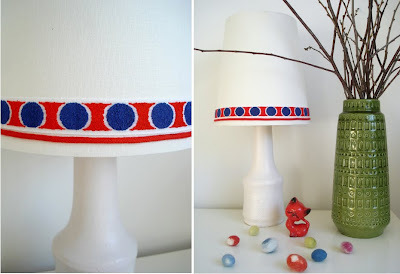 Found a lampfoot at the second hand store, bought a lampshade at good old IKEA and just glued some vintage ribbon on it. And yes, Peter (my husband) you are right: I didn't do it straight, but for a 60 secs-craft it's good enough! the 60 secs were so worthwhile!!!! looks great! Thanks for the award, Hannah, that is so sweet of you! I have the same vase! Nice lamp also. Such a nice find that ribbon. And a very clever way to use it! That's a wonderful idea. Thanks for sharinng. sooo cute, and I am sooo with you - crafty projects are in piles here, but time is limited to breathing in and out - sooo shame on me you are still waiting for your MANNER pouches - but next week next try!!! Wat leuk dat ik jou tref via Bloesem. Ik volg Bloesem ook al een tijd, errug leuk. Hoe is t verder ? ik heb voor mijn verjaardag ook een hele stapel oude lintjes uitgezocht op marktplaats, heb er vooral kleren mee versierd, maar een lamp is ook een geweldig goed plan!